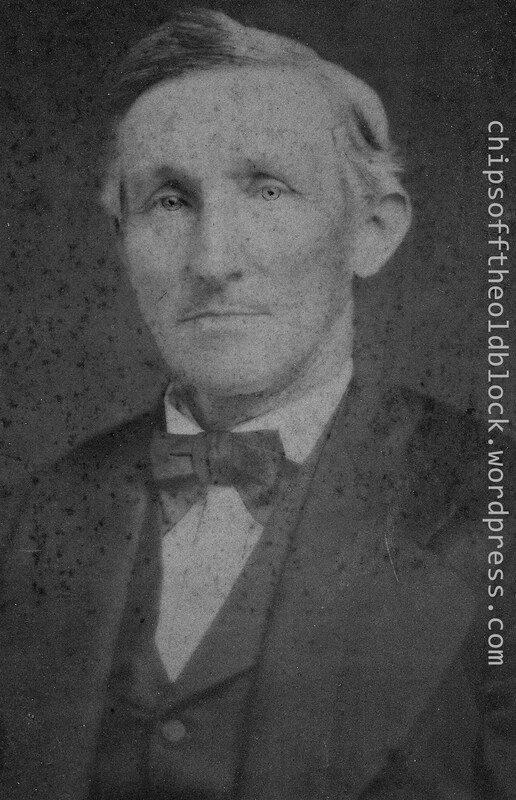 When we left off with the story of John B. Jaques (see Part III), it was 1870 and he was living in Newark with his wife Mary and sons Walter and John (Civil War veteran, former drummer boy highlighted in a recent post). John Sr. was still estranged from his father at this point, and had yet to seek help with his rehabilitation from a serious addiction to alcohol that had driven him to a life of petty crime and at least one stint in state prison. 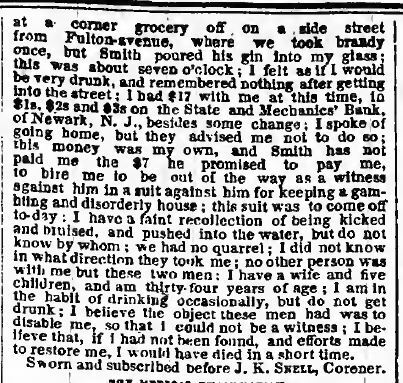 In March of 1872, John was arrested for stealing some coats, as reported in the New York Tribune on the 28th of that month. Somewhere between then and his 1879 reunion with his father (documented in the past post, Wayward Jaques son returns home), he sought and found help to get sober and straighten out his life. He was in his late 50s by then. After I read in the Oswego paper about the father-son reunion, my first thought was about whether John Jr. managed from then on to live in a permanent state of sobriety. His father died the following year; with dad gone, did John Jr. have the will and courage to continue coping with the numerous temptations that would naturally have come his way in normal, everyday life? 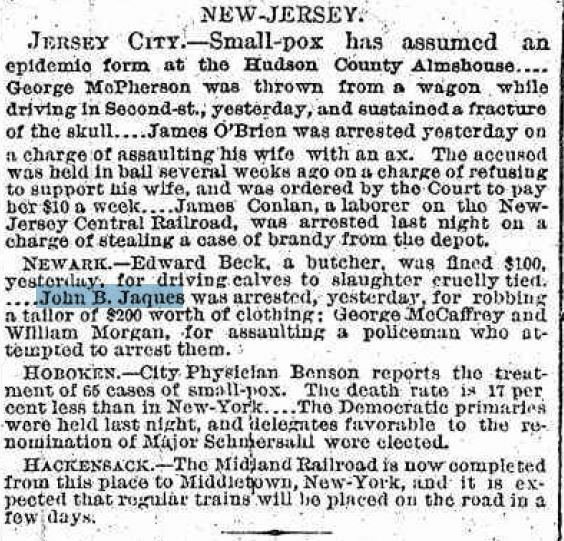 One answer to that question came from a New York Times article published on 3 September 1892, about an Elizabeth, NJ, robbery of the Walter P. Angus home at 25 Reid Street, and I thank blog reader Mary Keenan for pointing the article out to me. John’s first name is never given, but it is crystal clear from the contents that it was he who perpetrated the crime. 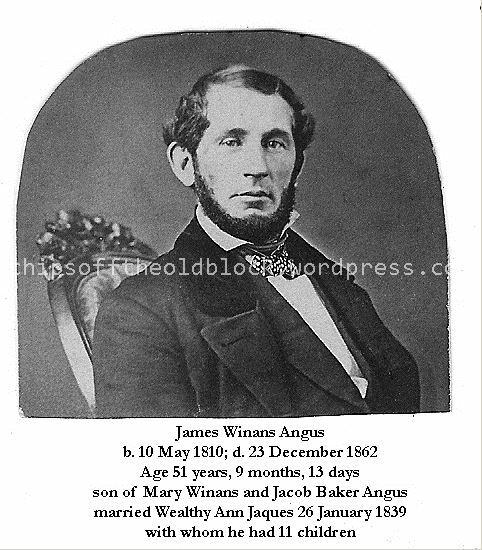 Walter P. Angus was one of John’s nephews, a child of John’s late sister Wealthy Ann Jaques Angus. 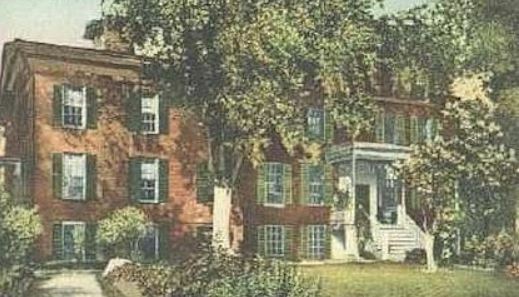 This was the home Wealthy lived in until she died some six months earlier, so with “big sis” permanently out of the picture, little brother with the alcohol problem seized a moment when the family was on holiday in Ocean Grove (NJ) and Walter was at work in NYC to break in and rummage through the household. John walked off with roughly $200 worth of clothing and jewelry. 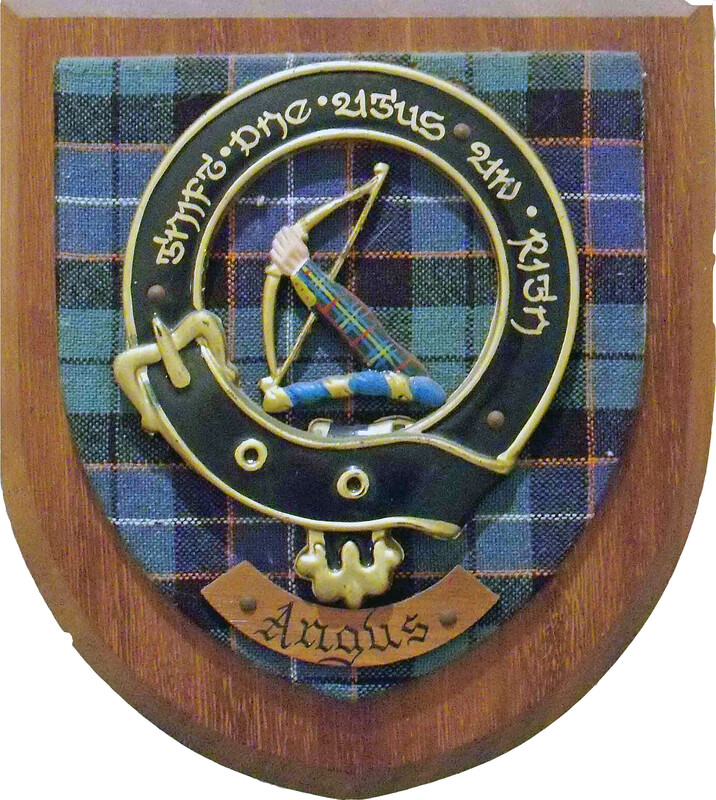 The police were called and after a bit of discussion and investigation, it was determined that an old man named Jacques, a relative of the Angus family, who had been boarding in this city perpetrated the crime. 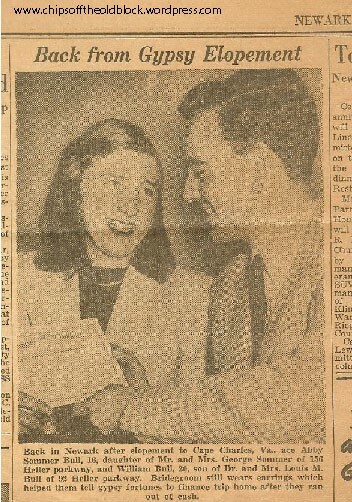 The article went on to mention that John was wanted for a charge of forgery, having paid his latest board bill with a forged and worthless check. The search for John had thus far proven to be fruitless: They have been unable to find any trace of him, and he is supposed to have left the city. Jacques’s father many years ago was one of the largest real estate owners in the central part of the city, and one of the streets there is called after him. Jacques is supposed to be somewhere in New-York City. So, no, sadly it appears that John fell off the wagon at some point and was engaging in the classic activities of an addict– either drinking or looking for a way to finance his next drink. Newark Alms House on the Elizabeth/Newark line. 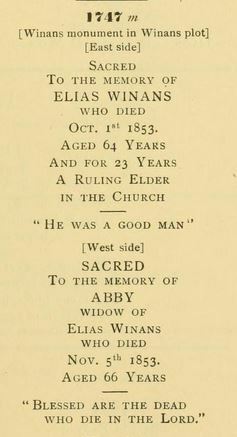 Final confirmation of John’s sad demise came in the form of his death record, which I received in the mail some two months ago: John died of stomach cancer on 19 Dec 1895, at the age of 73 (it’s rather amazing he lived that long, given his lifestyle). The death occurred at St. Michael’s Hospital in Newark, and prior to that, John had been living at the Newark Alms House (aka the poor house). 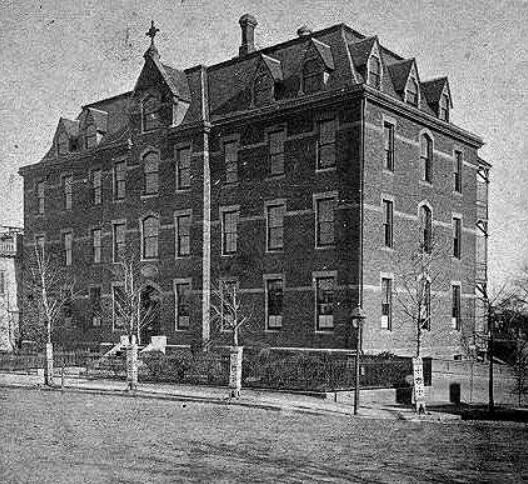 According to the website The Poor House Story, Poorhouses were tax-supported residential institutions to which people were required to go if they could not support themselves. 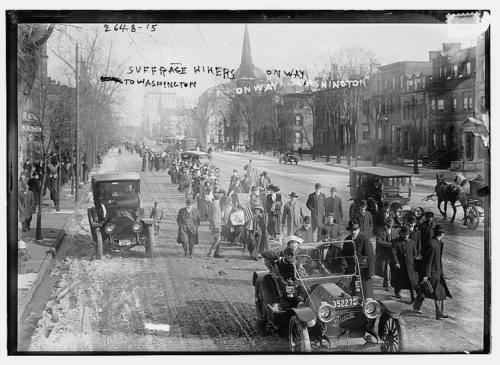 They were started as a method of providing a less expensive (to the taxpayers) alternative to what we would now days call “welfare” – what was called “outdoor relief” in those days. Evidently, Newark’s first alms house was a godforsaken place where the down-and-out and society’s deviants were dumped. 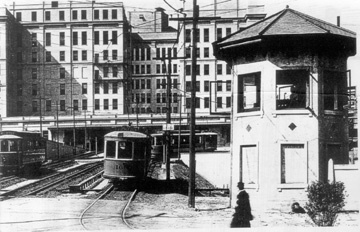 The Old Newark website provides a description (click here). 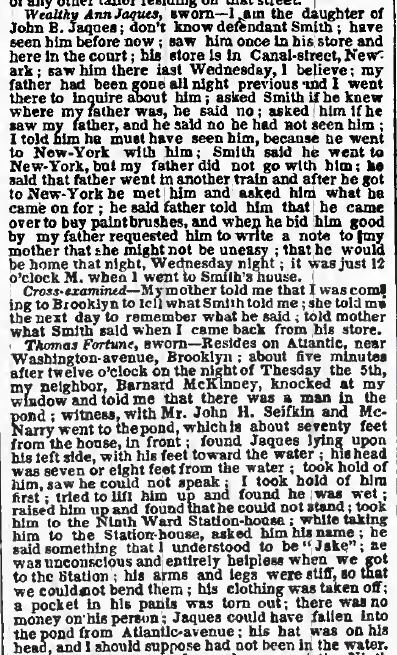 A glimpse of the situation for one poor soul who met his maker there in 1867 was described in this NY times article. Whether a new alms house was in existence by the mid-1890s, I don’t know. 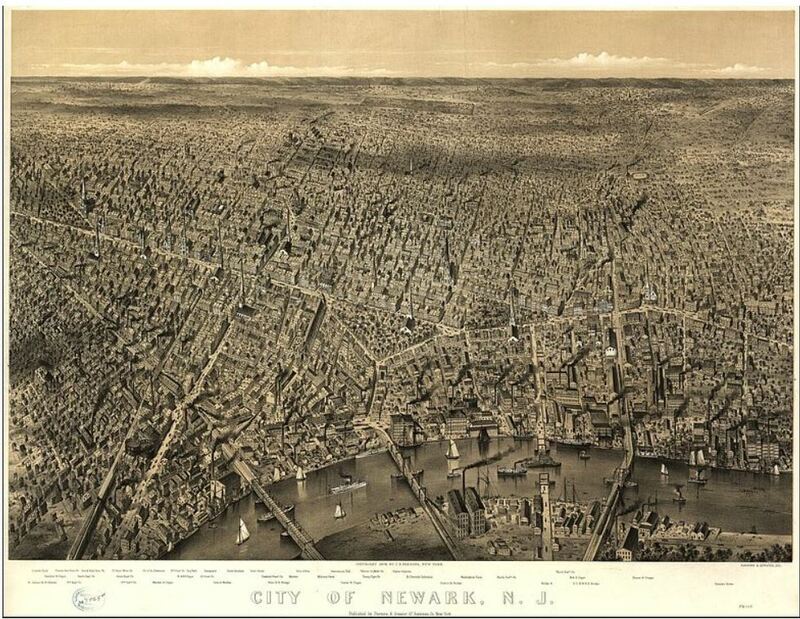 The census of 1880 gives an idea of the types of people who ended up here (visit the Newark Research website). Margaret may well have been residing there with John. I found a death record for a ‘Margaret Jaques’ for 31 December 1896 (just over a year after John’s death), and this may have been her; had she been an alcoholic, too, a death at 50 would have come as no surprise. 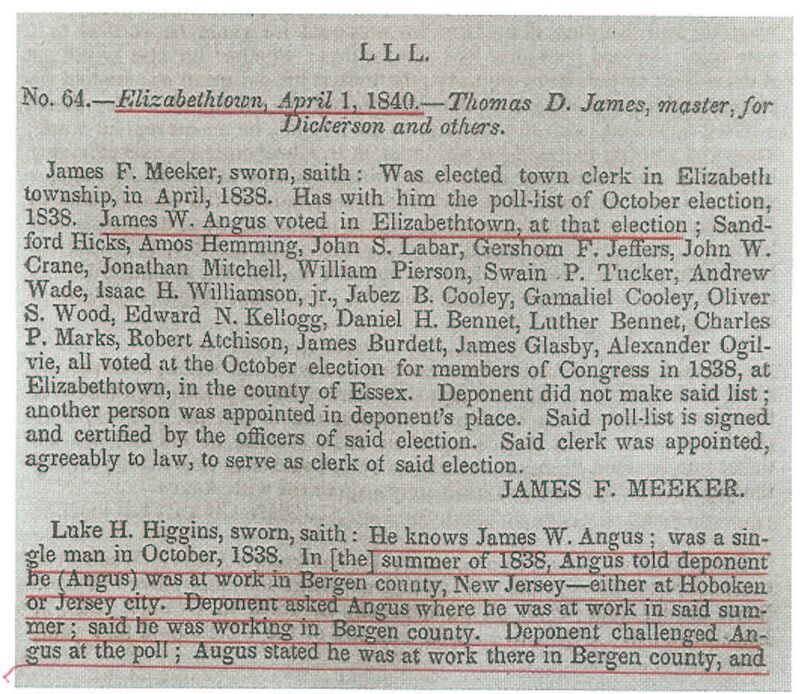 John B. Jaques was buried in Evergreen Cemetery, Hillside, NJ. If he was buried in his father’s plot, he is in an unmarked grave as no marker appears for him in that vicinity. That is the extent of what I know about John B. Jaques Jr. He has numerous descendants “out there,” and I have managed to track down a few lines into the early part of last century. It still amazes me to think that John’s existence had been hidden from us until quite recently, and it took the Fulton History newspaper archives website to reveal him to me. I can now attest to the veracity of that site’s tagline: Finding the Angels & the Devils in the Family Tree since 2003! How do you spell “Aye-yai-yai-yai-yai”? 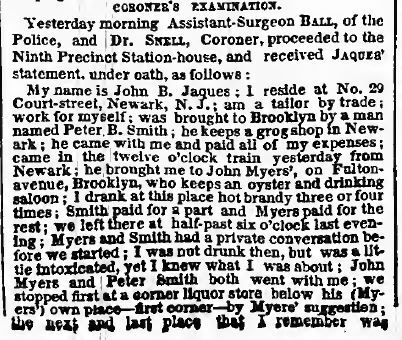 I truly did an eye roll when I found out our buddy John Jaques, whose escapades have filled several blog posts already (Wayward Jaques Son Returns Home in 1879, Part I: The Early Years, and Part II: The ‘Infamous’ Brooklyn Case), had an alias. I mean, how many of us ever think of our ancestors as having aliases? (It’s hard enough trying to track them down using their real names!) Up until recently, it never entered my mind. 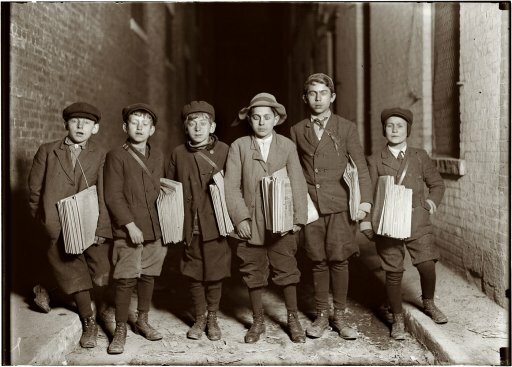 Have you discovered any ancestors with aliases?! I realize many people have reinvented themselves throughout history for many good and practical reasons, and that artists, writers, athletes, singers and others have stage names, pseudonyms, etc. 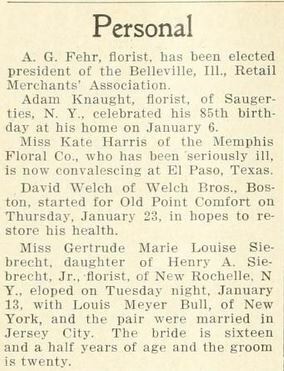 Or maybe someone just wants to fit in; for example, Alphonse de la Flechelle’s son (also named Alphonse) may have used the alias ‘George Stanley’ to feel less foreign (although something like ‘Alfred Fletcher’ would have made more sense…). But when it comes to criminals, you just know reasons exist that are suspect to say the least. What’s interesting, in fact, very interesting, about the case of John is that his alias matched his grandfather Samuel B. Jaques‘ middle name of ‘Barron.’ And that led me to believe that John’s middle initial ‘B’ very likely stood for ‘Barron’ as well. (Someday, we’ll figure out exactly where the Barron name* came from.) Did he resort to using Barron at the request of his Jaques relatives who must have grown very tired of the unwanted media attention and town gossip? Or did he come up with the idea on his own to spare his elderly father? At this stage, who knows? But, in a way, I was glad to discover the Barron alias, because it helps to further prove the family link between him, his father, and his grandfather. Well, let’s dig into the 1860s to catch up with John. Last we left him it was February 1858, and he was involved in that nasty business in Brooklyn. 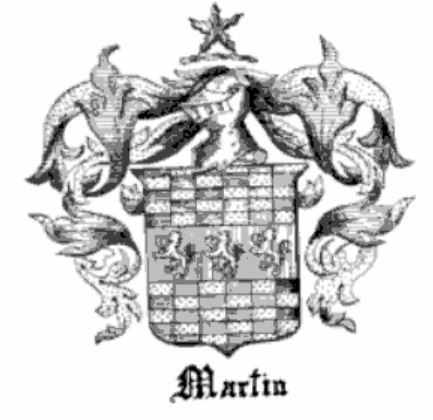 In 1860, he was 37 years old according to the census taker and living in Newark, Essex Co., NJ, with his wife Mary (32), and four of their five children: ‘Weltheann’ (misspelling of ‘Wealthy Ann’) – age 15, Mary (13), John Jr. (11), Margaretta (9), and Walter (6). Below is what I managed to find for John’s activities during the 1860s, and I have no idea how comprehensive my findings are. Suffice it to say, he was continuing along the same road as before, and probably worrying his family to no end. In March of 1865 he was arrested for forgery. 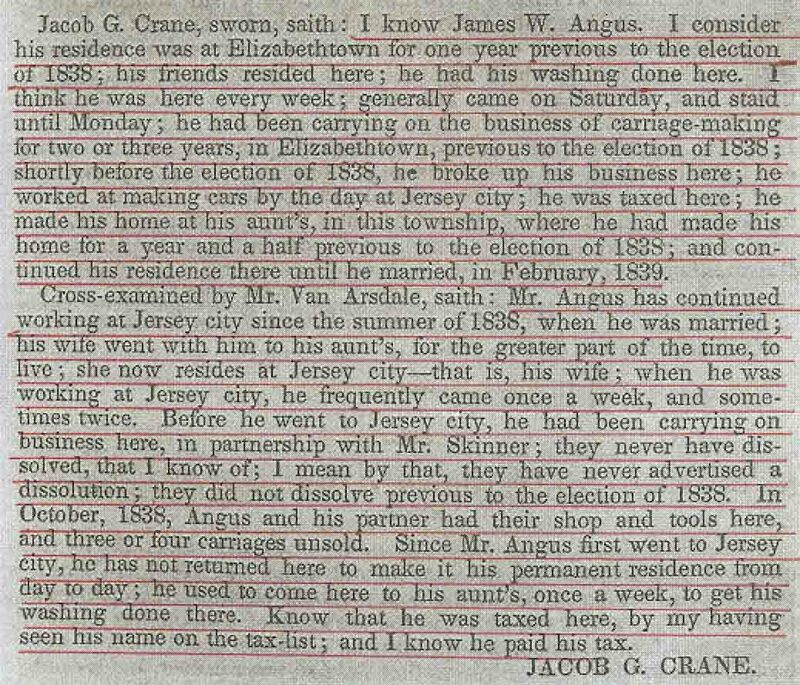 The Newark Daily Advertiser carried a brief paragraph on the 16th of the month: ARRESTED FOR FORGERY – A tailor named John B. Jaques, residing in Broad St., has been going around among the brewers of this city in order to obtain money. He received $12 from Messrs. Lorenz and Hensler, and gave them a due bill signed “A.C. Smith per J. Nolan.” The bill proved a forgery, and Messrs. L. & H. had the man arrested. He is now under commitment. 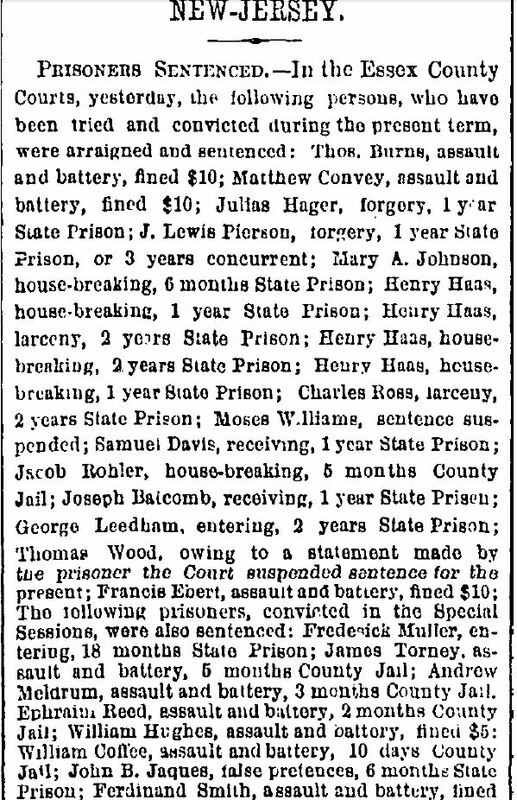 I found another arrest for 1865, this one in November, and this is where the alias came in. 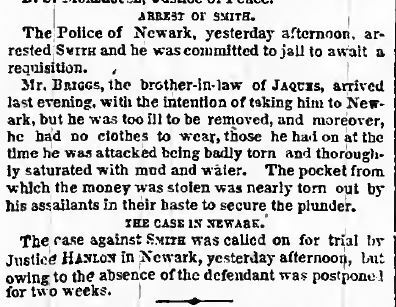 On the 15th, the Newark Daily Advertiser published: LARCENY – John B. Jaques, alias John Barron, of this city, tailor, was arrested in New York yesterday by Officer McCafferty, of the Sixth Precinct, on a charge of stealing five cloth coats from John G. McGreggor, of No. 2 Bowery. 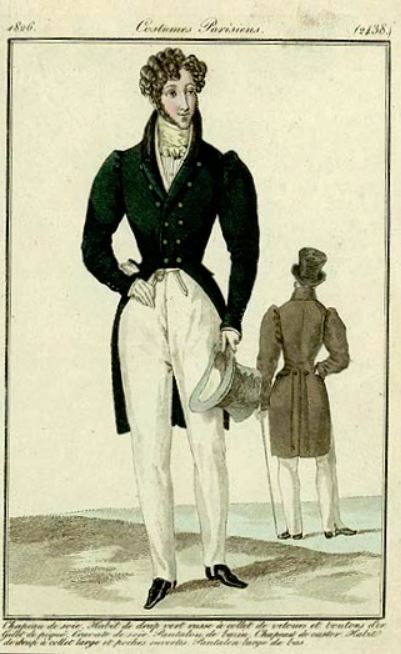 The coats had been given to the accused to make up; instead of doing so, he sold them to Thomas Walker, of No. 36 Centre street. Committed by Justice Hogan. By the end of the decade, it looks like Mary and Margaretta, who would have been about 23 and 19 by then, respectively, had flown the coop as well. According to 1870 census records, the girls were no longer in John and Mary’s household. I found evidence that Margaretta married someone with the last name of Stansbury, but have yet to look into that further. 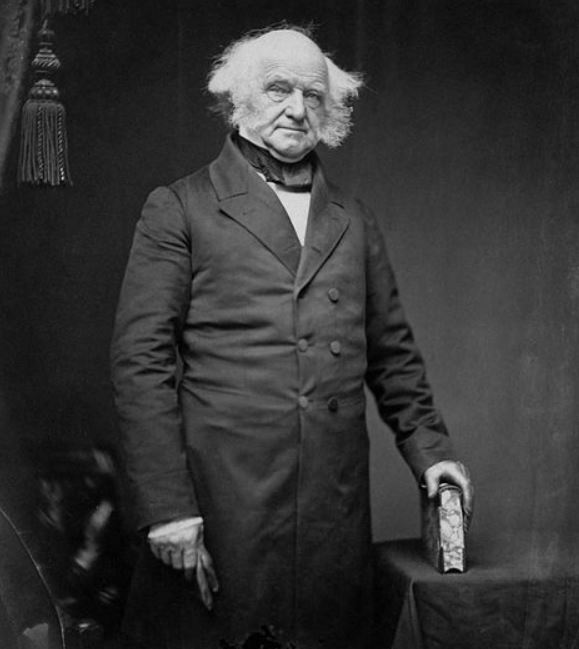 So by 1870, the household was down to four: John (48), Mary (43), John B. Jr. (21) and Walter (16). Both boys were working in a jewelry shop, so obviously they decided to avoid their father’s and grandfather’s line of business. Who knows what John’s reputation was by now, and it’s a shame, because nearly 20 years prior, it looks like he was really wanting to make a go of the tailoring profession. J. 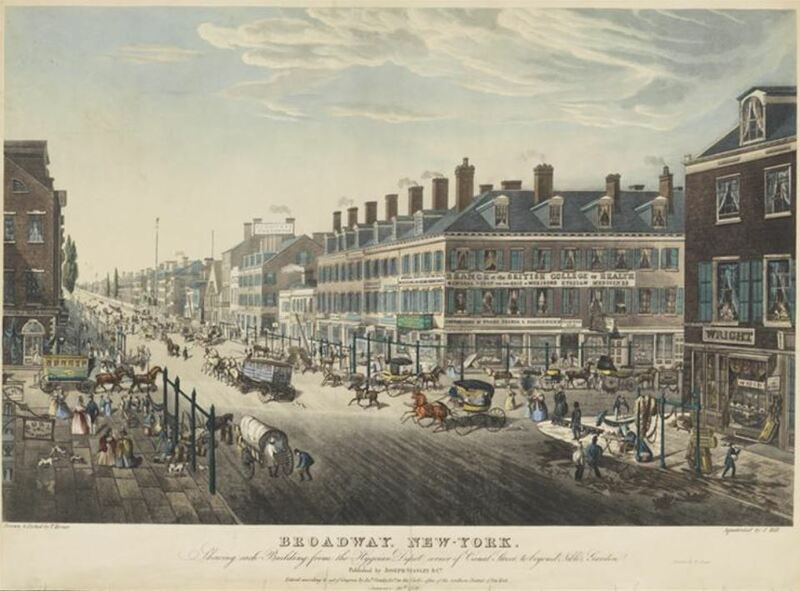 B. JAQUES would respectfully beg leave to inform his friends and the public of Newark generally, that he has located himself in Bolies’ place, the first door from the corner of Broad, under Mr. Towle’s Dry Good Store, for the purpose of conducting the Tailoring business. 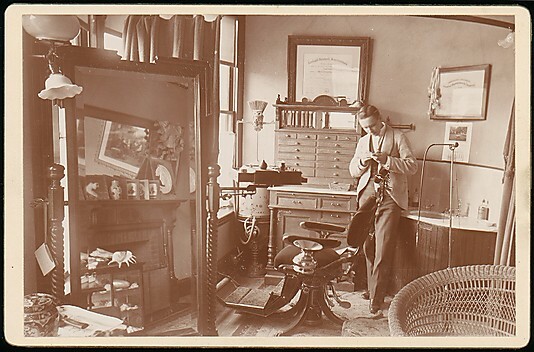 He is now prepared to execute all orders in his line in the best manner, most fashionable style, and on the most reasonable terms.– Having had long experience in the Cutting department, he feels assured that his customers cannot fail of being well pleased. Gentlemen wishing to furnish their own material for making up, will please call on me before purchasing. I will take great pleasure in going with them to make the selection. N. B. Repairing done with neatness and despatch. We know of no individual who can take precedence of J. B. Jaques in skill and scientific requirements. J. 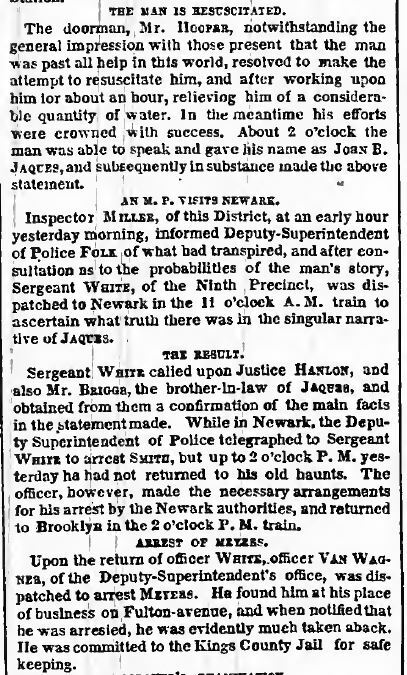 B. JAQUES, TAILOR, would respectfully beg leave to inform his friends and the public of Newark generally, that he has removed to the business stand occupied by Mr. R. W. Holmes, No. 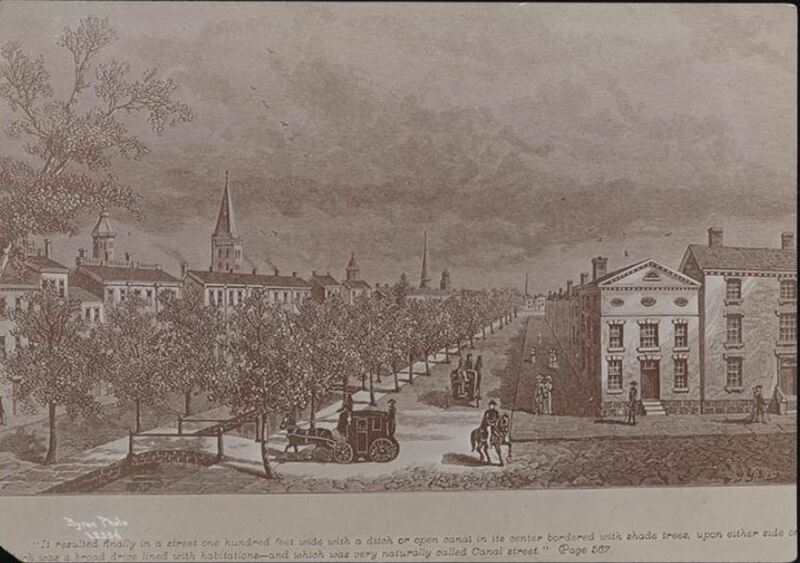 323 Broad street, below the 1st Presbyterian church, and will continue the Tailoring business there–having exclusive charge of the Custom Department. 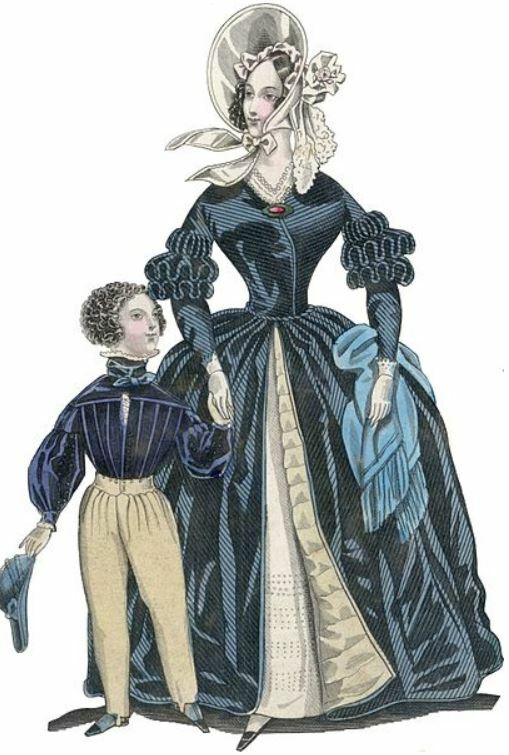 He is now prepared to execute all orders in his line in the best manner, most fashionable style, and on the most reasonable terms.– Having had long experience in the Cutting department, he feels assured that his customers cannot fail of being well pleased. Gentlemen wishing to furnish their own material for making up, will please call on me before purchasing. I will take great pleasure in going with them to make a selection. N. B. Repairing done with neatness and despatch. Cutting carefully and punctually attended to. I’ve found nothing to suggest that John was ever responsible for any major crimes. 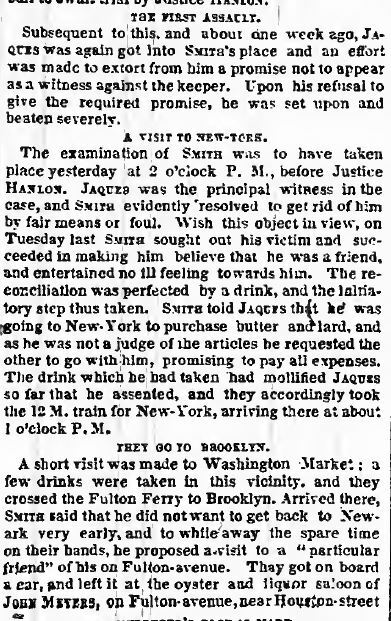 His run-ins with the law and misguided behavior stemmed from his problems with alcohol–at least that’s what I surmise, having read the 1879 temperance column. I feel most for John’s family who lived on tenterhooks, never knowing what he would get up to next. There will be one more post on John, I think. And that should wrap things up. 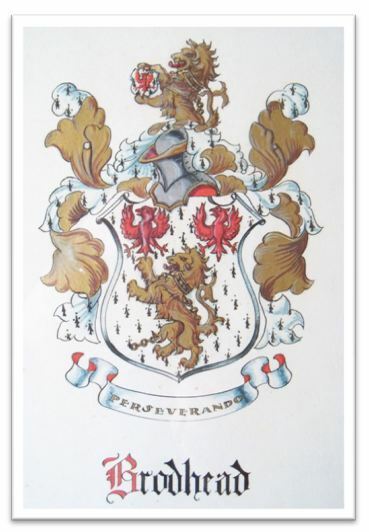 *Re: the Barron family – from p. 61 of History First Presbyterian Church of Woodbridge, New Jersey 300th Anniversary (Carteret, NJ: Hoffman Printing Corp; 1975): Without a shadow of doubt, one of the most interesting of the early Woodbridge families is the Barron Family. 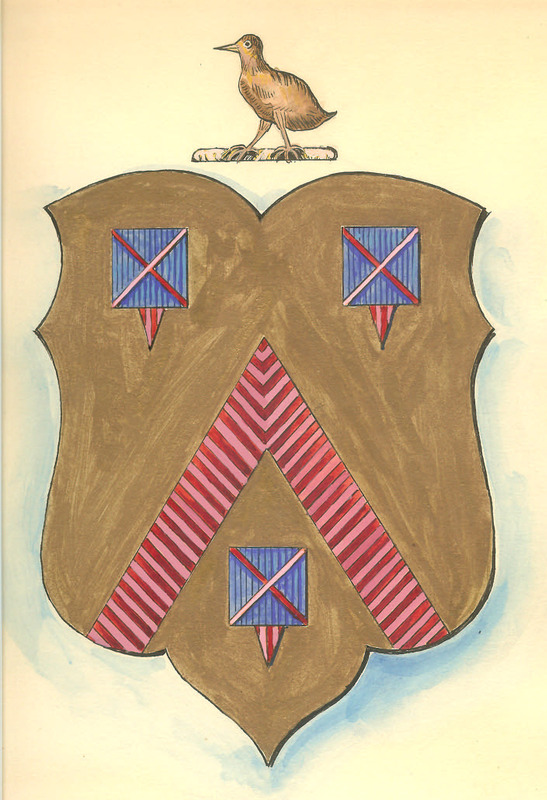 The Barrons are descended from the Palatine Barons of Burnchurch, County of Waterford. Ireland. The patronymic name of the family was FitzGerald. The last branch of the FitzGeralds, who were Barons of Burnchurch, retained for several years a station of rank and influence in Kilkenny. When they became involved in the troubles of the times they were forced to abandon their native shire and settle in the bordering county of Waterford. To escape the rancor of persecution and elude its vigilance they assumed the cognomen of Barron instead of their patronymic, FitzGerald. The FitzGerald family can be traced back to the Battle of Hastings and William the Conqueror to the year 1066. The earliest traceable individual member is Walter FitzOtho in 1086. The first member of this family, who now called themselves the Barrons as apart from Baron, who came to America, was Ellis Barron. He came to Watertown, Massachusetts in 1640 with his first wife Grace and their five children. 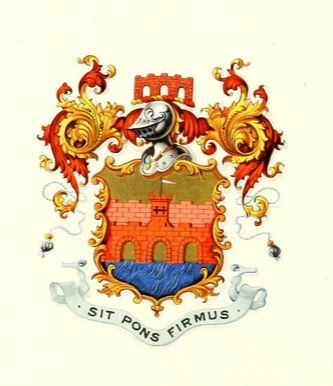 A grandson of Ellis, Elizeus by name, born June 4, 1672 in Groton, Massachusetts, came to Woodbridge about 1690 and was considered as among the first setlers. Elizeus had a son. Samuel, born in 1711 and who died on September 1, 1801. 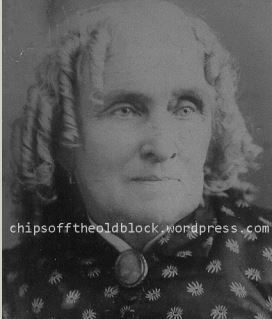 Just after the New Year in 1858, John Jaques resurfaced in the newspapers in a story that one paper referred to as ‘one of the most infamous cases ever placed on record.’ He was 34 years old, his wife Mary — in her early 30s, and their eldest child Wealthy Ann — about 13 years of age. Walter, their youngest, was about five. John’s dad, the respected Isaac Jaques of Elizabeth, NJ, was about 67 and long retired after a successful career as a Manhattan tailor and an Elizabeth, NJ, real estate investor. 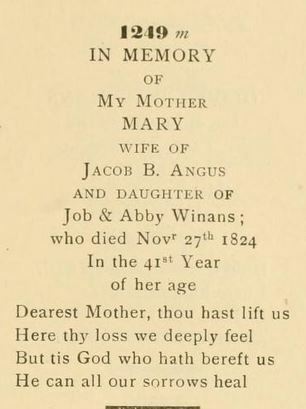 John’s mom (also named Wealthy Ann) had died of consumption some two years prior, in April 1856. 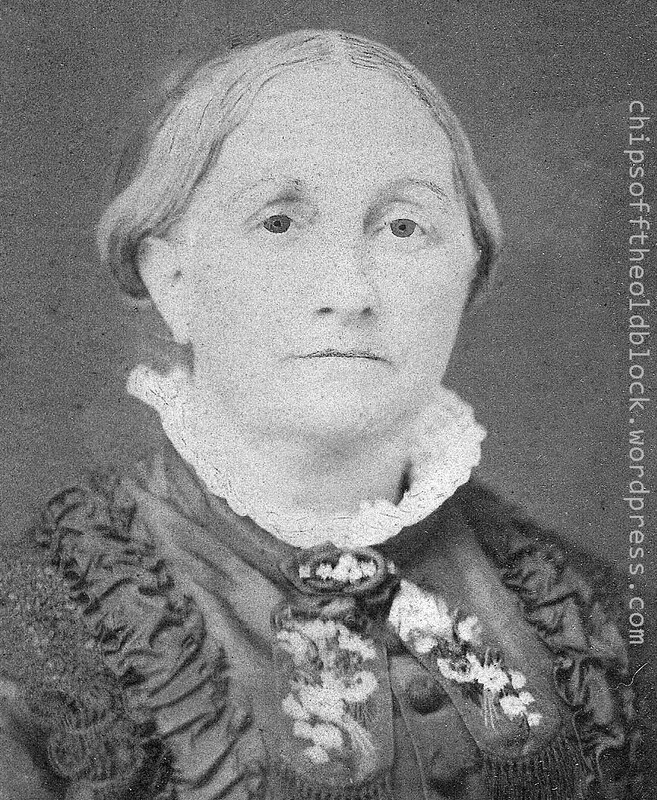 Sometime between Wealthy’s death and the 1860 census, Isaac remarried — to Rebecca Robinson, so he could have already been married to Rebecca at the time this ‘infamous’ Brooklyn case was the talk of the town, state, and tri-state area (the story even made it into the Boston Herald and the Philadelphia Press). 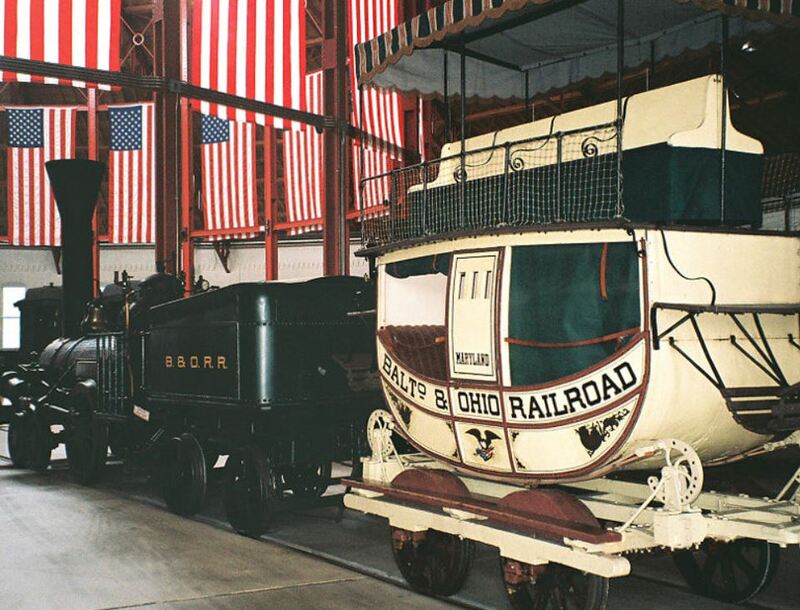 Thanks to the generosity of the Fulton History website’s lack of copyright restrictions, I can post the articles here. And that’s a great thing because, just like the previous post’s article about John (the ‘Prodigal Son’ returns), these articles are (naturally) written in a way that reflects the tone of that era, something I’d find impossible to convey should I be forced to paraphrase or re-word. So enjoy the read. 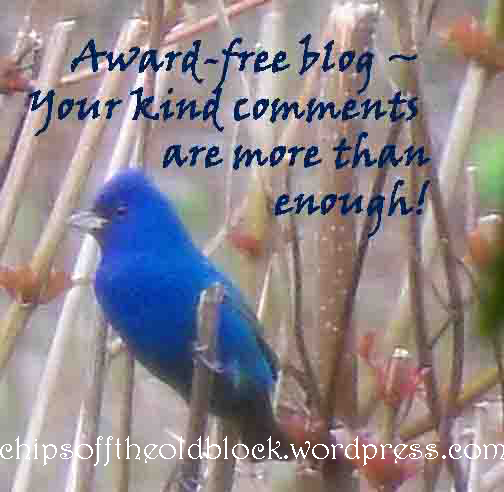 This post will be followed by 1-2 more as we are still in the 1850s, and John lived another 37 years. As always, comments, thoughts, corrections, and additions welcome. 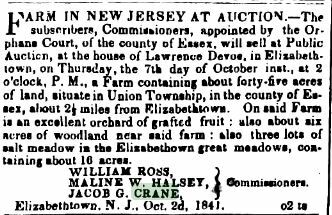 Jamaica, NY, Long Island Farmer, January 7, 1858 (www.fultonhistory.com). 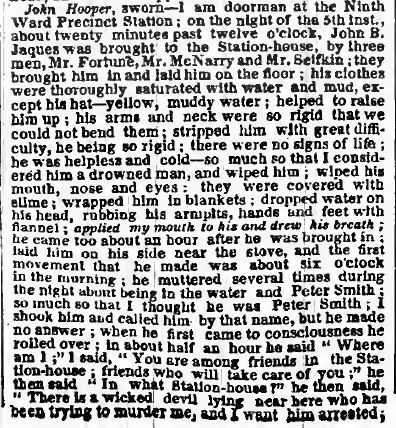 Trenton State Gazette (8 January 1858): Mr. John B. Jaques, of Newark, New Jersey, was found insensible in a pond in the Ninth Ward of Brooklyn, on Wednesday morning. 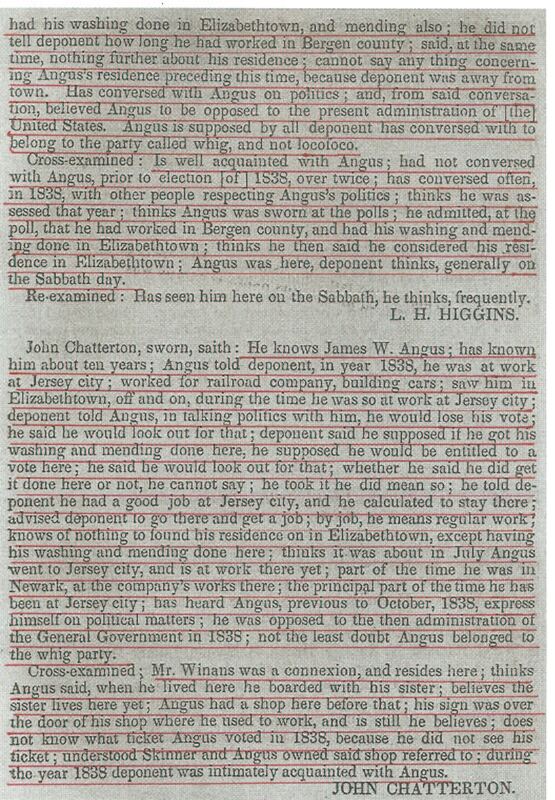 It appears that he had been inveigled from New York by a man named Smith, the keeper of a saloon, and against whom a charge was pending for selling liquor without license, and Jaques was the principal witness for the prosecution. 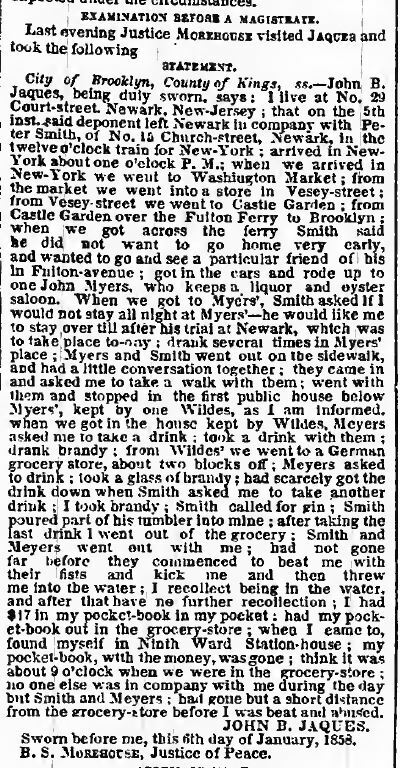 Arrived in Brooklyn, Smith was joined by one Myers, the keeper of a saloon on Fulton Avenue, when they robbed and threw Jaques into the pond where he was found. 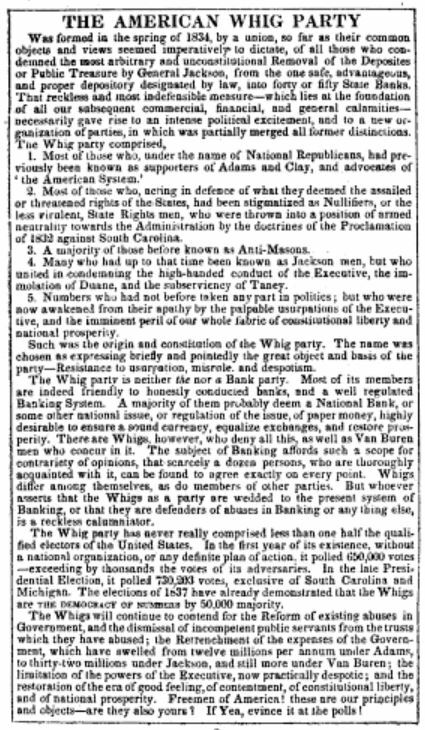 New York Herald, 19 February 1858: …the defendants were arrested and had a partial examination before Justice Morehouse, when they waived further examination, and were committed to await the action of the Grand Jury. That body indicted Myres and Smith for assault and battery with intent to kill, and also for highway robbery. The present trial was for assault and battery with intent to kill. The evidence of Jaques was substantially as above; that of Dr. Ball went to show the extent of the injuries which were at the time thought to be of a serious nature, although Jaques had subsequently entirely recovered from them. The witnesses for the defence went to show that Jaques could not be believed under oath, and that he had been arrested for various offences in New Jersey, and that indictments were there pending against him. 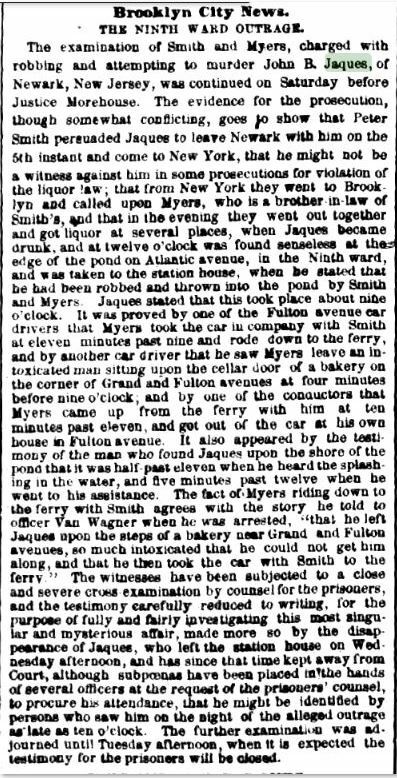 They sought to prove that Myres and Smith separated from Jaques on the night of the affair, and that the injuries were the result of his falling while intoxicated. 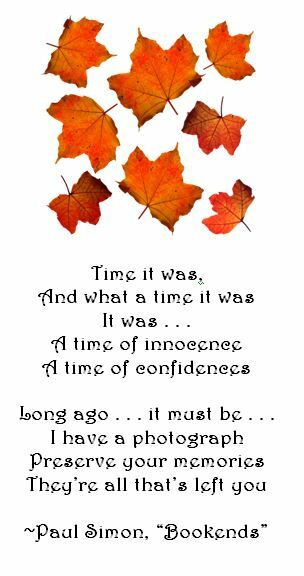 The trial was concluded yesterday afternoon and the case given to the jury, who, after a long absence, returned a verdict of “not guilty.” The defendants were then discharged, their own recognizances being taken to appear and answer the other indictment. 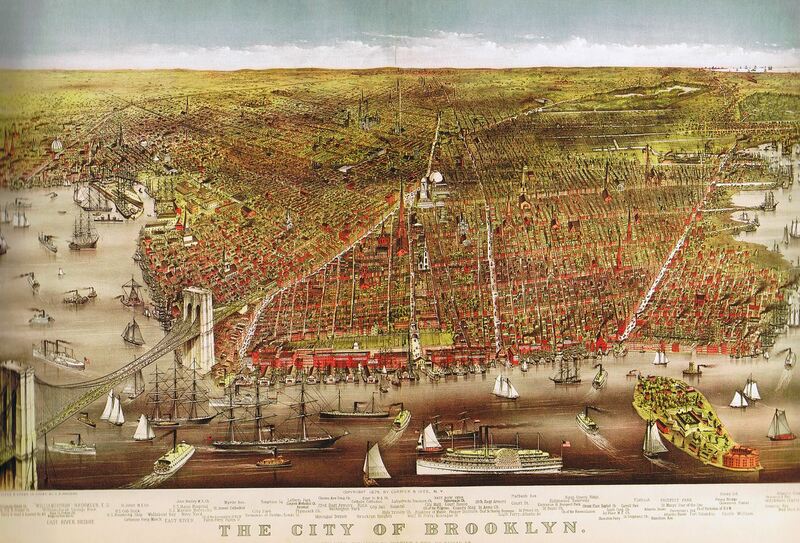 Resources: Those interested in Brooklyn of that era will enjoy the website Whitman’s Brooklyn: A Virtual Visit Circa 1850. 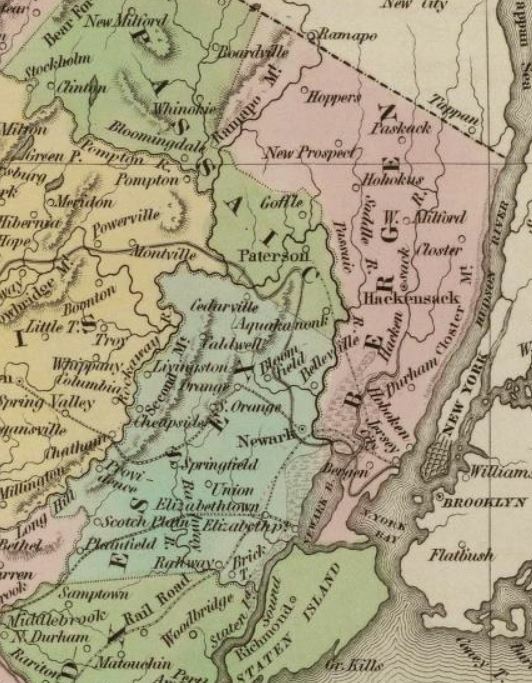 David Rumsey Historical Map Collection, Full Title: Map Of The Country Thirty Three Miles Around The City Of New York. Published By J.H. Colton, No. 86 Cedar St. New York, 1853. Drawn by G.W. Colton. Engraved by J.M. Atwood, N.Y.
Currier & Ives image from Eric Homberger: The Historical Atlas of New York City: A Visual Celebration of Nearly 400 Years of New York City’s History. Holt Paperbacks, 1998, page 72 (see Wikimedia Commons link) – ‘This media file is in the public domain’ in the United States. This applies to U.S. works where the copyright has expired, often because its first publication occurred prior to January 1, 1923. See http://copyright.cornell.edu/resources/publicdomain.cfm this page for further explanation. This image might not be in the public domain outside of the United States; this especially applies in the countries and areas that do not apply the rule of the shorter term for US works, such as Canada, mainland China (not Hong Kong nor Macao), Germany, Mexico, and Switzerland.